After reintroducing us to the world of Cardcaptor Sakura in volume one, the second volume in the continuation of CLAMP’s second series ups the pace quite considerably, while introducing plot points that seem like they will have a major impact as the story moves forward. While shutting Sakura and Kero out, Eriol is still in contact with Syaoran, and they are both worried about the appearance of the new cards – they don’t know what, but something big is coming and they are busy preparing for whatever it may be. Pretty much every scene that Syaoran is in has some element of foreshadowing, so the threat is hopefully going to be bigger than anything Sakura has had to deal with before. Considering Sakura is supposed to be one of the most powerful magicians in the world at this point we need something that’s really going to challenge her, as it’s not something we always see in the standard captures which mostly follow a logical solution. The four new cards captured here follow the established pattern of Sakura encountering the card, working out a logical solution, then executing it with the cards she has. She does get into considerable danger at times, but each card has an anticlimactic finish. There’s more focus on her avoiding being seen by her classmates when the cards unleash their powers in the middle of her school day. She still can’t fool her older brother though and Touya knows there’s something going on. He’s always been a bit of a dark horse, but it sounds like this time he’s going to serve a major role – he’s been recovering his own magical powers and has been coming up with a plan in case things go wrong, something he’s quick to reassure worrisome Yuki of in a brief but heartfelt exchange. Interactions between the characters have always been a series strong point and we get some great moments for a lot of the cast. Takashi remains one the best characters with his false factoids, capturing not just Sakura and Syaoran but new transfer student Akhio in his hilarious lies. Akhio bears a close resemblance to Sakura with a similar character design; she has slightly longer hair and has two ahoge cowlicks rather than Sakura’s one, but they share similar family names and personalities. This does mean they strike up a quick friendship, and Sakura feels almost like an older sister in the way she wants to help and show Akhio around on her first day. It’s too early to tell whether she’ll be a good addition to the cast, but being close to Sakura already means we should be seeing a lot more of her in future volumes. There’s definitely a lot in here though and it moves forward at quite a pace, but does it without feeling rushed; it’s not that time advances quickly, but a lot happens in a short space of time. If you’re reading this after watching the recent anime adaptation, you’ll be glad to know that the filler that held the anime back isn’t present in the manga, so the story flows a lot better. Each page is explicitly constructed to advance either the story or character relationships, without getting bogged down in the finer details. The artwork is generally good too and is genuinely engaging. Some of the card battles can feel a little busy with the amount of black used in each panel, but for the most part it’s what you would expect from CLAMP. It’s a shame the opening pages of each chapter aren’t full colour as they are really well done. One thing that does irk me and has continued to since the first volume is the font that is being used for spells. It’s a very Papyrus-like, hard and thin font that, while offering emphasis, looks a bit out of place with the rest of the manga. I think something softer and more bolded would have worked better. While it’s still early days, Cardcaptor Sakura: Clear Card is lining things up in a way that promises an eventual big climax. It has strengths in its shoujo elements and focus on character relationships, but falls short when it comes to capturing the cards. This volume has definitely got me interested in what’s ahead though and I’m eager to continue with volume three. 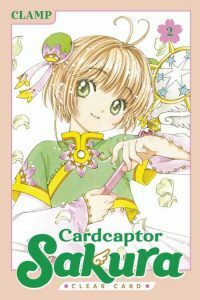 Cardcaptor Sakura Vol. 2 is available physically at retailers and digitally on most eBook platforms. For full availability, check the publisher’s website.